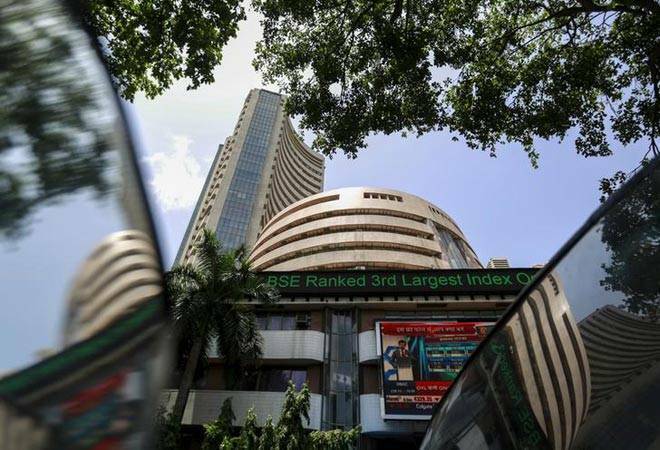 Indian equities, the BSE Sensex and the NSE Nifty, closed on a strong note on Tuesday, hitting fresh record highs in the intra-day trade, led by surge in buying across financials, auto and fast moving consumer goods (FMCG) space. The investor sentiment was buoyed by a 'near normal' monsoon forecast by the India Meteorological Department (IMD) and dovish comments from the Reserve Bank of India after it slashed report rates by another 25 basis points. The BSE Sensex hit an all time high of 39,364.34 in intra-day trade and the NSE Nifty crossed 11,800 mark to hit a fresh high of 11,810.95. Paring some of early gains, the BSE Sensex closed at 39,275.64, up by 369.8 points or by 0.95 per cent, and the NSE Nifty settled at 11,787.15, up by 96.8 points or by 0.83 per cent. In line with benchmark indices, the broader markets also settled in positive terrain, with Midcap and Smallcap indices closing at 15,521 and 15,171.71, respectively. IndusInd Bank, jumping nearly 4 per cent, stood out as the top Sensex gainer, followed by ICICI Bank (3.58%), Oil And Natural Gas Corporation (2.49%), Larsen & Toubro (1.82%), and Maruti Suzuki India (1.74%), among others. Meanwhile, Power Grid Corporation of India, Infosys, Godrej Industries, DLF and Tata Motors were among notable losers on the BSE Sensex pack. The Market breadth, indicating the overall strength of the market, was positive. Out of 2,920 traded shares, 1393 shares advanced, 1346 declined, while 181 remained unchanged. On the sectoral front, all the indices ended in positive terrain, barring realty stocks, led by bank, consumer durables and auto stocks. Among the individual stocks, Jet Airways shares tumbled 7.62 per cent to close at Rs 241.85 after debt-laden airline extended the cancellation of international operations till April 19 as the SBI-led consortium of lenders failed to reach a consensus on releasing emergency interim funds to the beleaguered airline in Monday's marathon meeting. The scrip declined nearly 19 per cent in intra-day trade after the debt-laden airline's former chairman and founder Naresh Goyal withdrawn from the bidding process as Etihad Airways and TPG Capital threatened to walk out of the deal. IT major Tata Consultancy Services (TCS) continued gaining streak for the second straight session and ended 1 per cent higher at Rs 2,132.45, extending its Monday's 5 per cent rally, after the company reported higher than expected 17.7 per cent year-on-year growth in its consolidated net profit at Rs 8,126 crore, while revenue for the quarter climbed 18.5 per cent to Rs 38,010 crore. Shares of ICICI Bank ended 3.58 per cent higher at Rs 406.80 on the BSE after the global rating agency Goldman Sachs hiked the target price on the stock and maintained the 'buy' rating. Polycab India made a strong market debut by listing at 18 per cent hike at Rs 633 on the BSE, against the issue price of Rs 538 per share.The stock closed at Rs 655, up 21.75 per cent with respect to its issue price.